Amyloid-like reversible self-assembly of peptide systems. 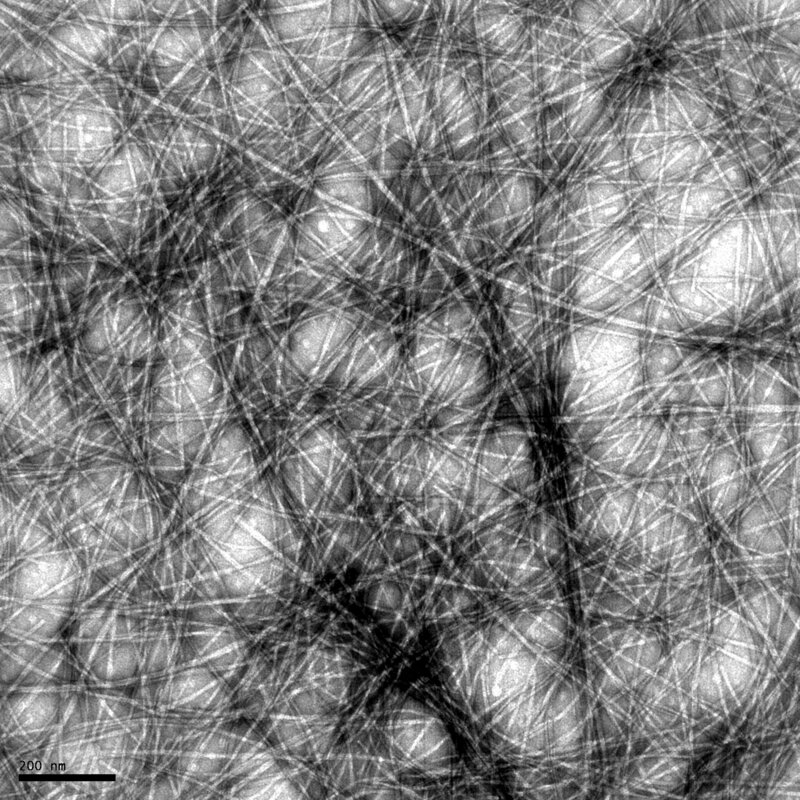 Amyloid fibres observed by transmission electron microscopy. Since the beginning of the years 2000, more and more examples of functional amyloid fibers have been discovered in bacteria and fungi as well as in the mammals’ realm[1-2]. Very recently, a study on about forty peptide hormones has demonstrated that those were stored inside pituitary secretory granules under the form of amyloid fibers. Beyond the structural biology question, we are especially interested in these molecules because we think they might be appropriate models to tackle broader issues like biomimetic self-assembly and amyloid formation – amyloid understood as “beta-sheet rich assembly”. Indeed, peptides are generally small and easily synthesizable molecules that, if our hypothesis is right, will form reversible amyloid-like assemblies whose structure and assembly mechanism will be carefully studied. 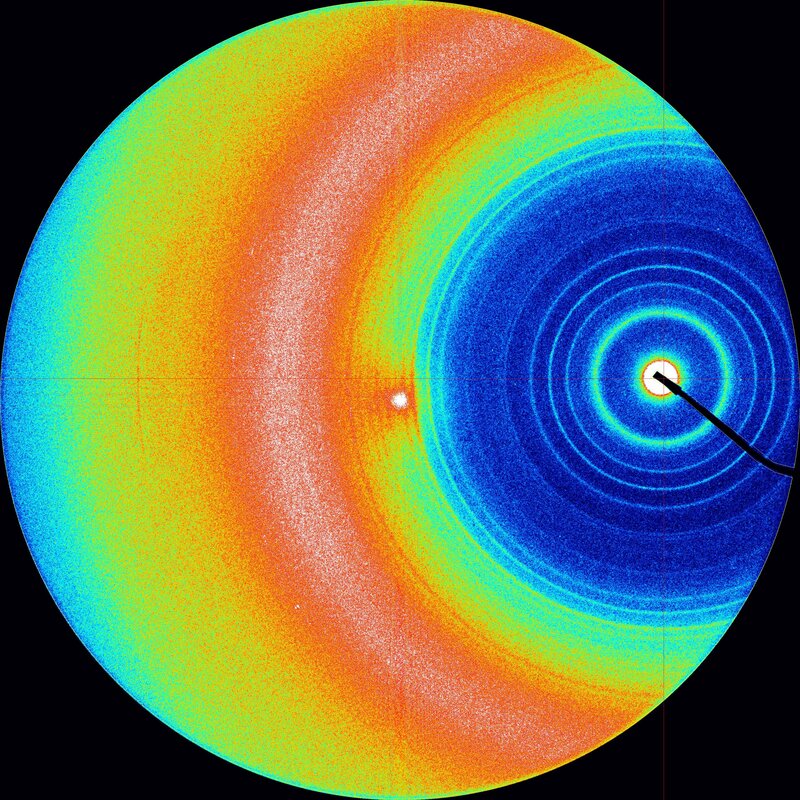 X-ray diffraction pattern of amyloid fibres. In this way, by comparing the structural analysis with the amino-acid sequences, we expect to get more insight in the general assembly rules of peptides and, possibly, of other types of amyloid fibers. Additionally, the specific features of the system (short molecules & reversible assemblies) should allow studies close to equilibrium, in particular giving access to mechanisms of assembly that can be next confronted with confidence with simulations and theoretical models. Indeed, one of the bottlenecks in the study of pathological amyloids is that their assembly is under kinetic control, which often results in irreversibility and in a high level of polymorphism. To implement this project, we propose to adopt a methodology combining optical and electron microscopies, vibrational spectroscopies and small angle x-ray scattering that will give us structural information at scales ranging from the ångström to the micrometer. C. P. J. Maury, Journal of Internal Medicine (2009) 265 329-334. S. K. Maji, M. H. Perrin, M. R. Sawaya, S. Jessberger, K. Vadodaria, R. A. Rissman, P. S. Singru, K. P. R. Nilsson, R. Simon, D. Schubert, D. Eisenberg, J. Rivier, P. Sawchenko, W. Vale, R. Riek, Science (2009) 325 328-332. R. Kodali & R. Wetzel, Current Opinion in Structural Biology 2007, 17, 48–57. J. S. Pedersen, C. B. Andersen, D. E. Otzen, FEBS Journal 2010, 277, 4591–4601.